This is a limited production of 100 Pirate Skull rings made for Studio City Tattoo by Bill Wall. 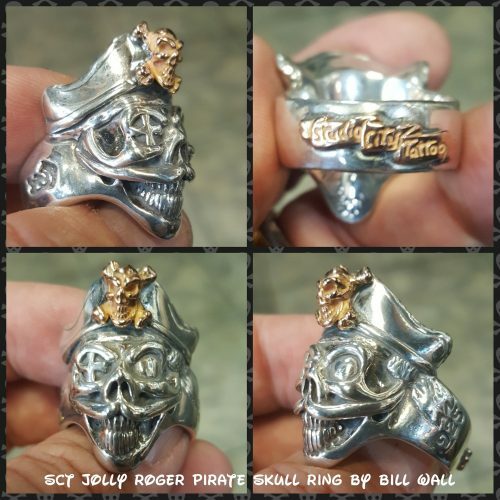 Each BWL/SCT Jolly Roger Pirate Skull Ring comes with special Studio City Tattoo Jolly Roger velvet bag along with one from Bill Wall Leather. Every ring comes with a certification of authenticity from Bill Wall. Bill hand signs and numbers these rings making them a collector’s piece. 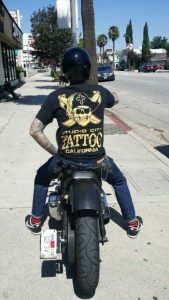 This ring is an artistic representation of our Studio City Tattoo Jolly Roger logo, with our cross put in the eye and Bill’s signature skull and crossbones put on the hat to represent piracy. Bill added an eye to the skull to keep a weather eye out for good luck to the wearer. And believe me, this ring has been good luck for Studio City Tattoo! The ring is meticulously carved from metal making a metal master. The metal master is used every time to make the castings. This means each ring will retain its original detail from the original piece of art that came from Bill’s hands. There are two versions, one is .925 sterling silver and the other a Sterling silver/18kt gold version.